SUMMARY: When one B2C company looked to use its marketing channels more effectively, it turned to email sends and social media. To grow its email subscriber base, the company decided to leverage its strength in social media and content to draw customers into regular email communications. Find out how ChefSteps, a company that seeks to transform how people cook at home, added more than 200,000 addresses to their email list by using Facebook to better reach and understand their audience, and give them more of what they want. John Lusk, Chief Revenue Officer, ChefSteps, a cooking company that seeks to transform how people cook at home, observed the quality of content his company was producing. He wondered if it couldn’t be used more effectively in email and social media to grow the organization’s membership base, especially through Facebook since they already had 30,000 fans at that time. "We felt like we really needed to amplify our own marketing channels," Lusk explained. "When we looked over the spectrum of paid (traditional advertising), earned (word-of-mouth) and owned (corporate), we weren’t investing much in owned and we had all this phenomenal content." "We primarily target really enthusiastic and curious cooks who want to become more skilled in the kitchen as well as those folks who are a little bit fearful," Lusk said. ChefSteps is made up of a team of James Beard Award-winning chefs, filmmakers, designers, scientists and engineers, he added, all of whom are focused on providing high-quality content that inspires and educates customers. "We're focused on, at this point in time, producing phenomenal content that really inspires people," he said. "Given the quality ... and uniqueness of our content, we obviously focus on those channels where we can get reach and distribution for that content," Lusk said. Social media is a very big realm for ChefSteps, which has active accounts with YouTube, Facebook, Instagram, Pinterest and Vimeo, among others. "Any sort of social channel that has massive reach where content really is the king — which is almost every social channel — we do quite well in that," he said. 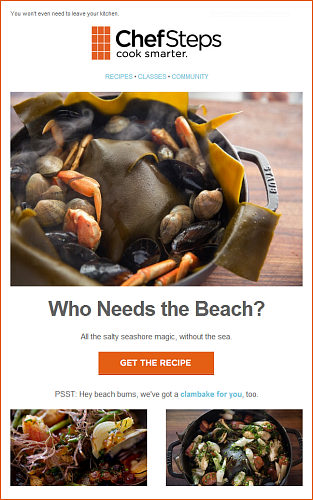 In the past, ChefSteps has primarily focused on marketing via social channels, but has recently begun advancing with email marketing. "We’re moving towards that route given the fact that we have a pretty sizeable membership base. We do interact with our members via email on a weekly basis and, in some cases, we break that into segmentation and personalize emails as well," he said. To grow their email subscriber base, the team decided to leverage their strength in social media and content to draw customers into regular email communications. Even though they’re focused on B2C, ChefSteps uses its wealth of content like savvy B2B marketers. In B2B, 40% to 70% of prospects will buy eventually, just not right now. B2B marketers, therefore, engage them in nurturing campaigns. They provide prospects information and ideas that will help them without trying to sell them anything. According to the MarketingSherpa Lead Generation Benchmark Report, marketers who did this had a 45% higher return on marketing investment. Likewise, instead of pushing paid classes, ChefSteps offers free classes, videos, recipes and more to people who provide their email. They believe these prospects will eventually graduate to the paid information. It’s why, when you go to the ChefSteps site, the very first thing you’ll see, emblazoned across the top of the page, is an invitation to provide an email address. "We didn’t want people to have to go hunting around for it," said Lusk. In spite of a lot of content being free, Lusk and his team believe it’s still extremely valuable to their organization and, most importantly, their customers. "We really feel like building a community and building trust within the community will naturally lead to more conversions to our paid classes," Lusk said. "So right now, our primary focus is building a community of very, very passionate cooks — whether they’re super-experienced in the kitchen or novices — and bringing them together, giving that confidence and providing that inspiration." To grow the community faster, the team commenced a campaign to collect more email addresses by sending more people than ever before to a ChefSteps home or landing page. 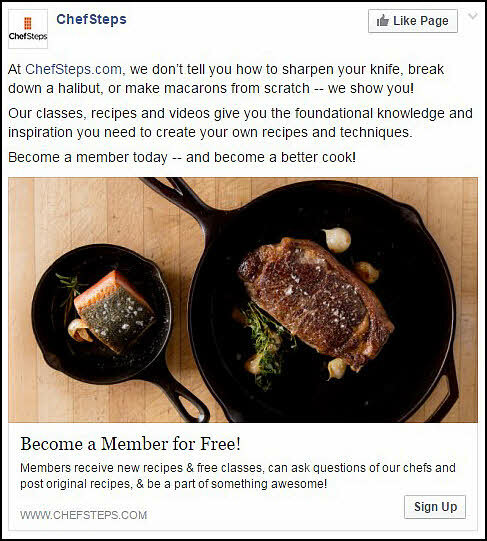 To do this, the team began testing images, copy and video in Facebook ads to determine which approaches would drive the most clickthrough to their site to sign up for emails and ChefSteps memberships. Because of this testing, the team realized that video was one of their most powerful tools. Discovering that video was the most compelling content for ChefSteps customers validated its heavy use in email sends. Every email sent links back to brand new video content, according to Lusk. "We believe we’re more successful because of the way we approach our videos. We actually show you the 'whys' behind the 'hows,'" said Lusk. "It’s very, very clear now that customers are finding video appealing in terms of storytelling and brand recall. So that’s something that’s been a huge lesson learned for us." 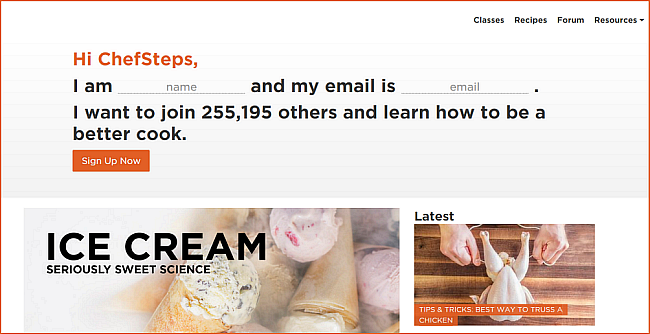 ChefStep’s emails, for instance this one promoting a video on ice cream, contain a clickthrough to popular video content, an image and small social media icons. However, the most prominent aspect is the video content. The most prominent aspect is the video content. Instead of filling the emails with copy that subscribers may or may not read, ChefSteps simply presents the video instead of trying to sell customers on it. Anything else would distract from the main value proposition: the quality instruction. Since the ChefSteps email program is still growing, keeping it simple is important, but the team does do some list segmentation. If a new class is being launched, they will manually review who has looked at similar content. For example, if there is a new class on seafood, the team might segment and send based on behavior, such as including those who had opened or clicked through on the seafood-focused "Who Needs the Beach?" video. The team analyzed who was clicking through from which links and aligned marketing efforts to attract similar prospects. Facebook calls this building a "look-alike" audience from a "seed" audience. According to Facebook, lookalike audiences allow advertisers to target more people who look like their established customers. A look-alike audience uses several kinds of user sets as a "seed" and builds an audience of similar users. The team used this tactic to attract clickthroughs from people who viewed content on Facebook or the website. "If somebody goes to the site and clicks on a specific topic — for instance, Sous Vide — we can retarget them on Facebook with an ad promoting our Sous Vide classes," said Lusk. The team does the same thing on Facebook. 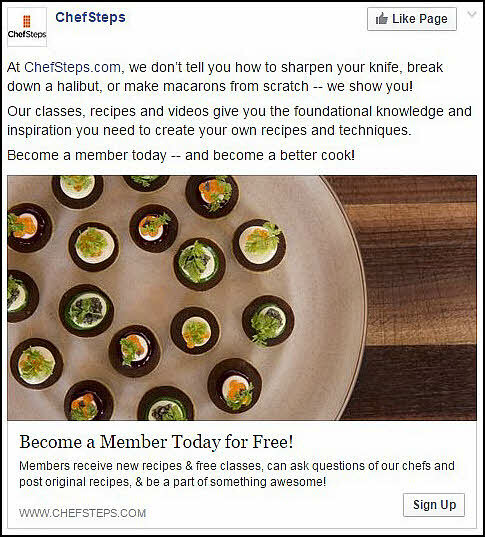 If someone views a video ad, for instance, ChefSteps retargets them with a specific advertisement inviting them to sign up. "We’ve taken a standard approach where you take a look-alike audience, load them in. [Then] you come up with imagery, your content, your ad copy," Lusk says. "You do your A/B test. You start watching what works and start testing with different variations of content, whether that’s video or photography." The team looks forward to even more growth because they’ve not optimized every opportunity, according to Lusk. "Our email program at this point is relatively nascent and something we’ll continue to invest in," Lusk said. "I’d say, right now, we’re at the basic level of email segmentation and marketing. 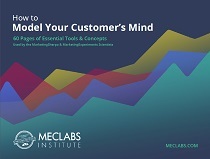 There’s a lot of opportunity for us to get smarter regarding our segmenting of customers — really understanding what they’re interested in, understanding their behaviors on the site, where they go to get information, what type of information, what type of recipes … there’s a whole slew of opportunities on the email side that we’re just starting to address." Nonetheless, the outcome has far surpassed Lusk’s expectations. "Ideally we were trying to grow our list between 25% and 30% per month. We just felt like, hey, if we can get that, that’s really good," he said. Social Media and Email Integration Predictions for 2014: Were they right?